A birthday party with famed jeweler Ben Baller and his family is always a good time. We’ve celebrated many special moments with them and have grown to care about their family very much – making this 1st birthday milestone event for Kaia important to us not only on a business level but personal, too. When Ben and Nicolette shared that they wanted to host an Alice in Wonderland-themed soiree, I was pumped! If you know me, I love the challenge of making a commonly used idea and making it our own and I wasn’t going to let the Baller family down. I immediately knew that I would avoid using the typical pieces or color scheme – I aimed for a subtler palette and interspersed tons of details. Keep in mind when you’re throwing your own parties – don’t shy away from using a theme that you’ve seen others use. You can absolutely make it your own and dazzle guests with customized pieces and elements that other party planners had overlooked. For example, all Alice in Wonderland parties incorporate the iconic rabbit. He’s essential! We opted for a plethora of rabbits – who says there can only be one? Break the rules and have fun with it. Mom, dad, and siblings were all dressed in Wonderland theme; rather than bold colors, they opted for a monochromatic look. As partygoers made their way through the hip Beverly Hills venue and to the ballroom, they were in awe of all the whimsical elements. At the end of the fuchsia-colored runner they had followed, guests were greeted by a stunning flower display framed around the doorway, a garden of very tall paper roses, and brown bunnies that seemed to multiply. 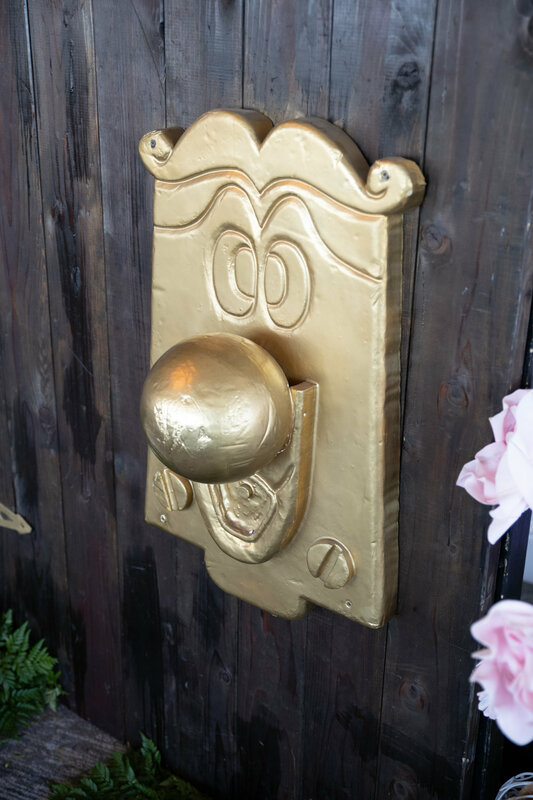 There was also a wooden door with an animated twisty knob – just like the one from the movie. Attendees especially loved taking pictures in this area! Inside, a custom black-and-white checkered floor with “Kaia’s 1st Birthday” in gold, surrounded by a grand teacup filled with live florals and collections of peach, grey, and cream balloons made a statement. A large etched black-and-white drawing from the original Alice in Wonderland book completed the classic look. Caged greenery, large metallic clocks, and Kaia’s name spelled out in moss decorated the bar area. 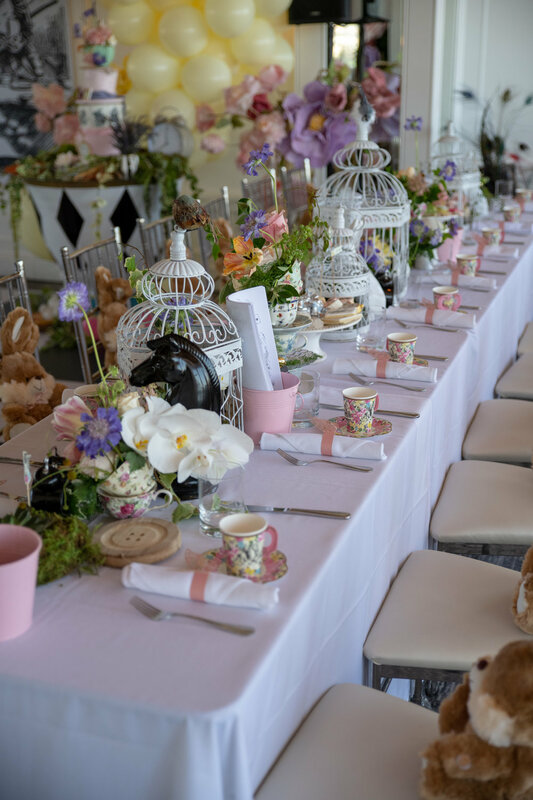 Additional blooms in lavender, dusty pink, peach, yellow and pops of punchy butterflies decorated round and rectangular tables along with white ceramic bunnies and mushrooms. Stacked teacups and pedestals with “Eat Me” cookies lined the centers of the tables, and at each place setting beautiful Alice in Wonderland-themed china was arranged. After guests had enjoyed lunch, they were served slices from the decadent four-tier cake. Layers of the confection were each uniquely decorated by hand, with the final tier crafted into a teal teacup. Loved ones made themselves comfortable on plush white seating as they mingled, drank scrumptious fruity mimosas, and enjoyed the additional sweets placed on cocktail tables. The Happen Photo Booth was on hand, of course, for revelers who wanted to capture the happy moments from the day. There were plenty of themed props available for them to use and pose with, and the pictures themselves had a sweet image of Kaia emblazoned on the front. Thank you to everyone involved for helping to make Kaia’s special day as memorable as it was magical!